Few publications, however august or important, have had quite the same continuous cultural impact on British life as British Vogue. You feel it shouldn’t be so – it is a magazine devoted to chronicling the clothes women wear, after all. Yet it has always been more than simply a fashion bible: at key moments in its history, Vogue becomes something different – a record of where and who we are. Or at least, would like to be. On Tuesday, I went to the National Portrait Gallery for a sneak preview of Vogue 100: A Century of Style with my hair piled damp on my head and a red blister below one eye thanks to a splash of fat while cooking the previous night. Overwhelmed by home, children and work, I had failed to liberate any sophisticated clothes from the dry cleaner’s, so pitched up in a jumper that I realised afterwards was beginning to unravel at the hem. This is my life and the life of many women. Yet I can look at the temple of style that Vogue represents and somehow feel I belong. 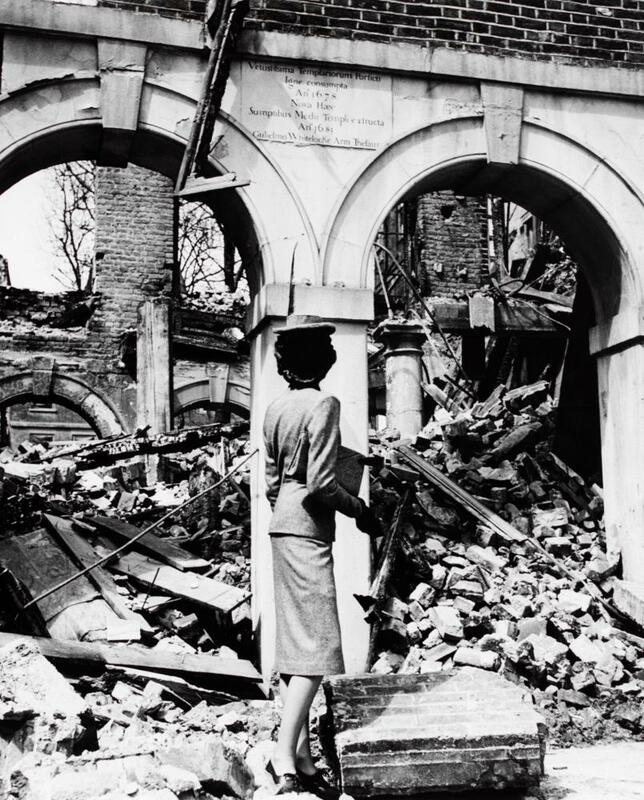 Like Cecil Beaton’s famous wartime image of a woman gazing at the bomb-damaged ruins of Middle Temple, London, I may be in the midst of chaos, but somewhere deep inside me, I should know how to wear a well-tailored well-tailored suit by Digby Morton. This mystery of inclusion and exclusion, of the highest fashion being at the centre of life, yet somehow apart from it, lies at the heart of Vogue’s appeal. And all of this is up for debate, prompted by the photographs that line the gallery’s walls. At one level, it is the quality of the images that guarantees Vogue’s continuing eminence. And there they are, the images glossy with beauty, dripping with class. Edward Steichen’s four cloche-hatted models (including Lee Miller) on a yacht, gazing out to sea like well-dressed nymphs; his portrait of a smiling Chaplin, leaning on a cane, dwarfed by his own shadow; Beaton’s Vivien Leigh, impossibly slim, surrounded by the detritus of photography itself, like “a Persian gazelle in the dark studio forest of chains and planks”. The Bloomsbury set flocked to “sweep guineas off the Vogue counter”, as Virginia Woolf put it in her diary in 1925. The novelist herself wrote no fewer than five essays for the magazine, and although Todd’s defiant literary pursuits were a commercial disaster (and led to her sacking), they set the template for something Vogue has continued to be – a magazine for smart women in every sense, for thinkers as well as fashion lovers. Down the years it has happily accommodated writers from Rebecca West to Jeanette Winterson, from Nancy Mitford to Antonia Fraser and Marina Warner. It has straddled the broad cultural landscape with considerable ease, perhaps because so few of the editors have been fashion specialists. Beatrix Miller, the editor who had a decisive impact on the magazine in her tenure from 1964 to 1984, once defined the topography she called Vogueland. It was, she believed, “relatively superficial, but in the broadest sense, it is the mood of the moment translated visually – the words people use, the books they read, the sounds they hear, the houses they live in, the pictures they look at”. The breadth of that base is reflected in the photographs. Fred Astaire dances, Alfred Hitchcock squats like a toad, John Osborne smokes, Francis Bacon broods, Kate Winslet shimmers, David Hockney paints in vivid technicolour – the cultural life of Britain has shimmied across the pages, presented through the eyes of photographers such as Beaton and David Bailey, who became famous themselves as they redefined what a portrait could do. Even Margaret Thatcher, who took a stern view of fashion magazines – “When we look at fashions, ordinary people like me, we would love photographs that show you what the clothes are actually like” – takes her place in the Vogue pantheon, stern but glamorous in black velvet and pearls, photographed by Bailey. That point of view encompassed a profound sense of place. It is there when the 1960s finally arrive – they swing late in Vogue’s pages, with the brave new world of youth breaking into its rarefied atmosphere in 67. But their entrance is spectacular: Terence Donovan shoots an advertorial for Hoover in Crawley new town, with the rain reflected on the streets making it strangely unreal and instantly recognisable. The same sensation of being rooted in the society from which famous people spring is there decades later in 1999 when Posh Spice, as she then was, and a young David Beckham are pictured by Juergen Teller sprawled in the corridor of the Midland Hotel, a symphony in beige with the cleaning staff lurking anxiously around the corner. It’s there too in the pivotal photograph from 1993 when Corinne Day shot “a cocky kid from Croydon” almost without makeup, in a translucent top, and simultaneously made Kate Moss a star and opened up a new direction for fashion photography. Where other magazines relaunch and alter, British Vogue has simply evolved, finding continuity within change. There is a direct lineage between the magazine that launched in 1916 and the one we buy today – it stays fresh by constantly reflecting the times without sacrificing its values. In this context, the arrival of what Parkinson mockingly dubbed “the Black Trinity” – Bailey, Donovan and Brian Duffy – had the same energising effect on its photographs as the Beatles had on music. In photographing Jean Shrimpton in frank closeup, Bailey treats her as a friend and lover, breaking with the remoteness of much that had gone before. Lord Snowdon, now the magazine’s longest serving photographer, also made an impact; his arrival in 1956 brought humour to fashion shoots and a different kind of formality to portraits of the new stars: Martin Amis intensely gazing at the camera, David Bowie posing on a park plinth. Twenty years later, the supermodels swept through, in all their big-shouldered, confident swagger, taking the breath away with their pizzazz, as in Patrick Demarchelier’s first cover of Naomi Campbell, dressed like a golden idol, or his vision of Linda Evangelista in sweeping Versace, chin raised, best foot forward. In latter days, Mario Testino, Nick Knight and Tim Walker all conjure startling images that are as redolent of their own times as Beaton was of his. One of my favourite photographs in the show is by Frank Horvat, taken in 1960, and designed to promote Bradford as a centre of the British woollen industry. It shows a smiling model surrounded by neatly dressed children on a cobbled street, and it’s full of life. It also reveals the tightrope that British Vogue has walked for 100 years – that precarious balance between the real and the unreachable, the dream and the grim reality. It is a tension with which even its own editors have struggled; in 1927 Alison Settle, who had a background on women’s pages in newspapers, took up her new post and grumbled that it was “unbelievable how snobbish it was”. Yet the Fabian socialist Audrey Withers, who regarded fashion as “slight and ephemeral” according to Parkinson had no difficulty in fitting herself to the editor’s chair. I’d go further. What puts Vogue’s photographs on the walls of an art gallery is its clarity of vision. You might dismiss that view as superficial, but it is impossible to deny the magazine’s power. Beaton wanted to call his autobiography When I Die I Want to Go to Vogue. It may not be heaven for everyone, but sometimes it comes pretty close.